I’ve always wanted to see a Walrus. Then again, doesn’t everyone? 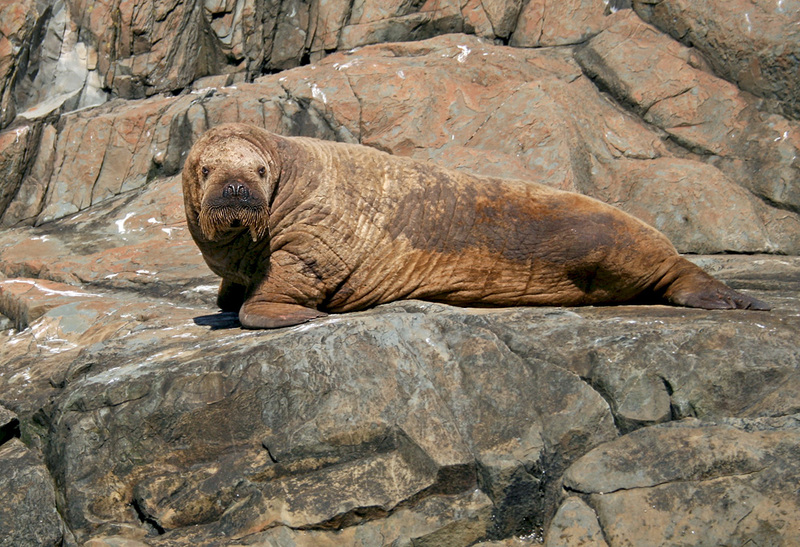 The Eastern Arctic population of these big, foreboding critters breed on the Labrador coast, but rarely wander further south. 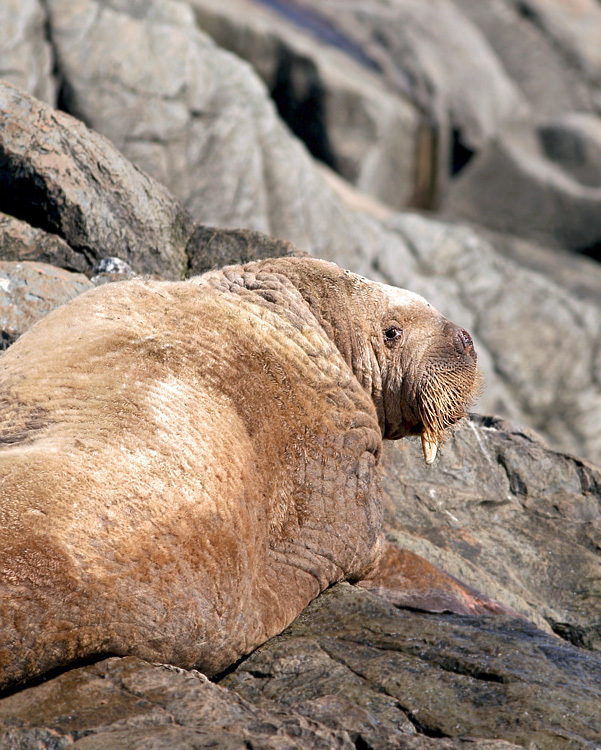 Walrus was once a regular sight in Newfoundland (as well as Nova Scotia and the Gulf of St. Lawrence), but that Northwest population was hunted to extinction by the late 1700’s. 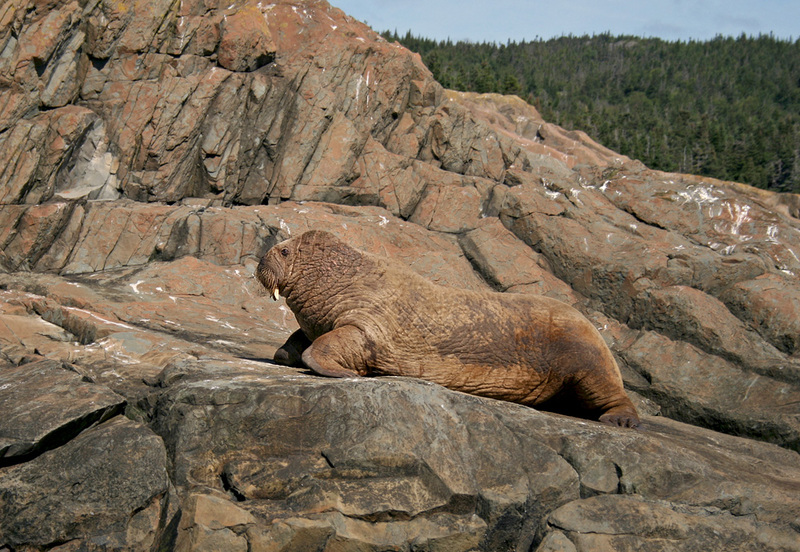 Since then, any sighting of a walrus in Newfoundland waters has been few and far between. I know of only a handful in my lifetime. 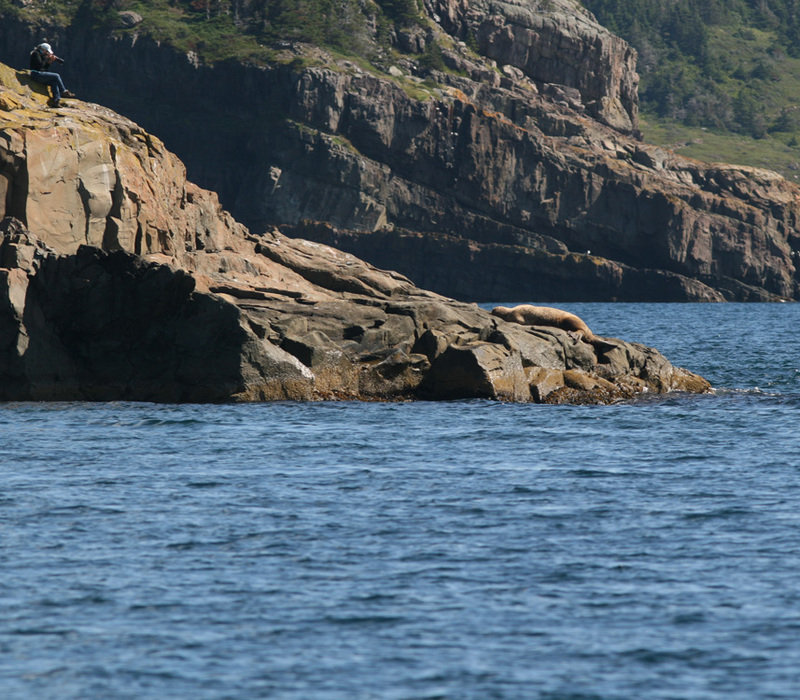 Earlier this summer, one was spotted sunning on a rock in Conception Bay, followed by another (or very possibly the same) spotted by a tour boat swimming around at the entrance the St. John’s harbour. These were one-day wonders and not exactly “chaseable”. So, when I got home from Grates Cove last night (after a long weekend with no internet or cell phone service) and saw a report that one had been spotted in Bay Bulls harbour throughout the day, my mental engines starting revving. I asked my friends at O’Brien’s Boat Tours to keep me updated on any sightings the next morning and went to bed scheming about how I might see it myself. 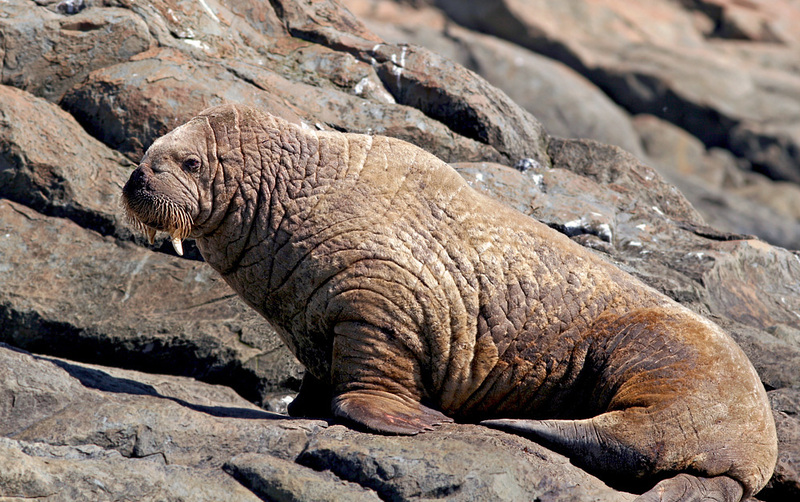 This could very well be a once-in-a-lifetime opportunity to see a walrus in Newfoundland! I woke the next morning and decided to take my chances, joining the first boat tour of the day at 11:30am. 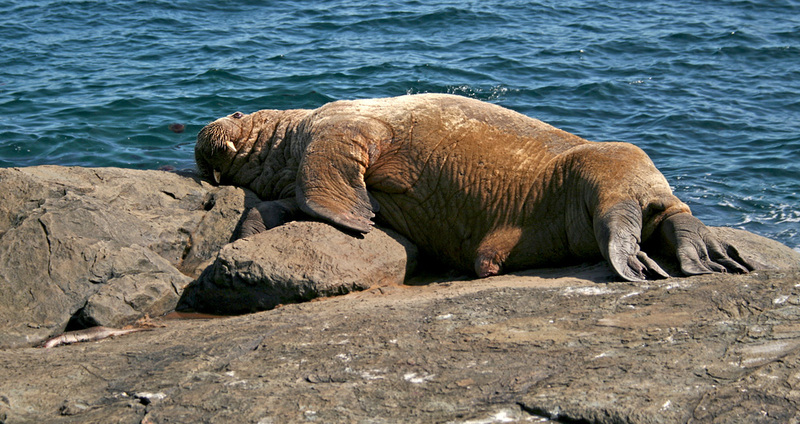 Shortly after arriving I got word that the walrus, thought to be a young bull (which we later confirmed), was still lazing around on the rocks … and we were off. Along with a small group of tourists (most of whom may not have realized how unusual the sighting was! ), I enjoyed great looks and some decent photo opportunities as “Captain Joe” brought the boat in for a closer look. 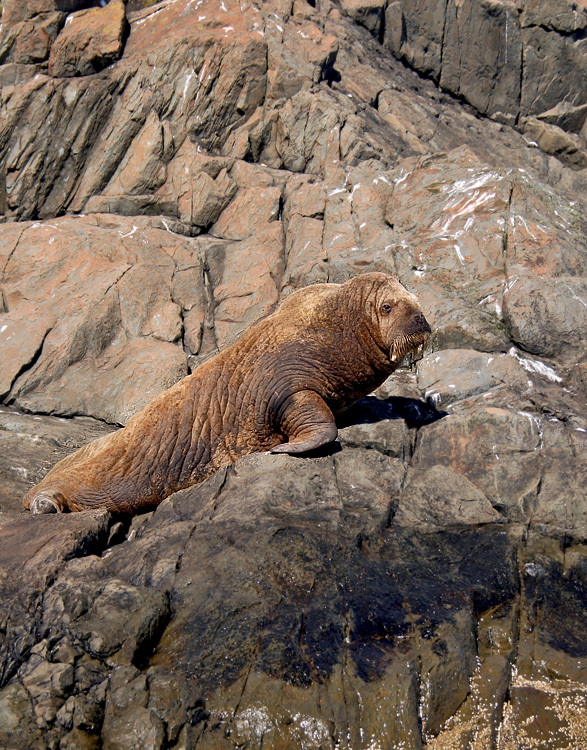 The walrus wasn’t too perturbed, neither by our boat nor a photographer perched on the rocks above it. After a couple passes, I was high on finally having seen one of these amazing beasts and sat back to enjoy the rest of the boat ride on a beautiful, calm ocean. We even glimpsed an Ocean Sunfish on the steam back to port. 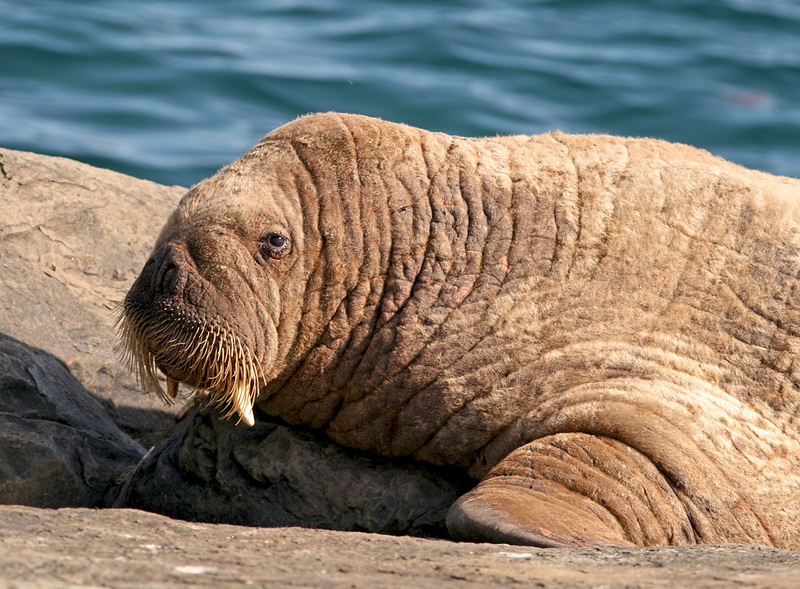 At times, the walrus looked like the majestic beast I expected it to be. This walrus happens to be a young bull (male), which we were able to confirm only by getting a look at the underside 😉 Both sexes have tusks and are not so easily sexed at this age on that feature alone. Now THAT’S a toothy smile! 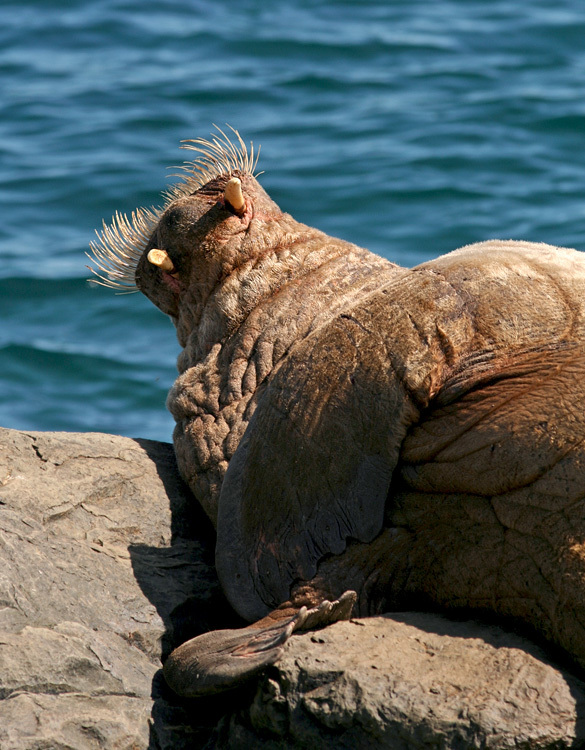 After spending much of the afternoon watching the walrus from our perch above, I got the feeling it was very lethargic … maybe a little too much so. I hope it is healthier than it often appeared to be. Thanks to Con O’Brien and the rest of the crew at O’Brien’s Boat Tours for helping me find this awesome critter – and for all the other great trips I’ve taken with them this summer. Fine crowd, them! 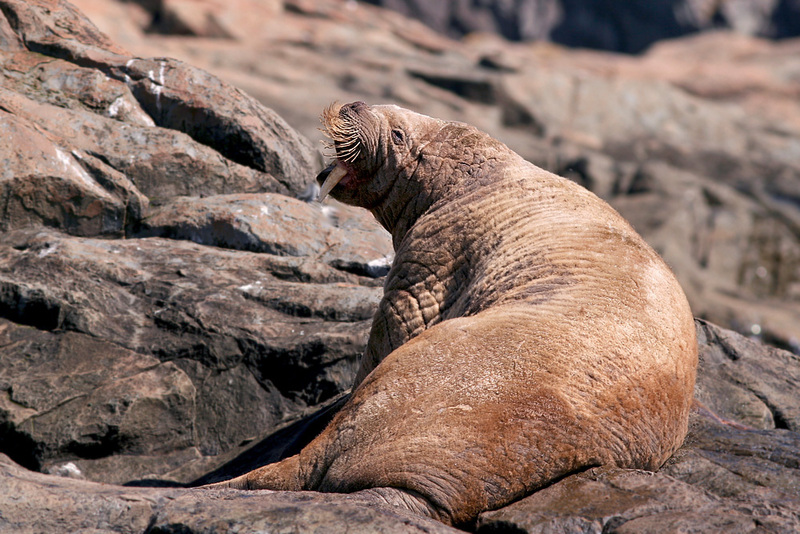 This entry was posted in Uncategorized and tagged Bay Bulls, Newfoundland, Walrus, Witless Bay Ecological Reserve. Bookmark the permalink. What a spectatular sighting!!! I hope it is healthy. Thanks for taking the time and effort to document this magnificent animal. 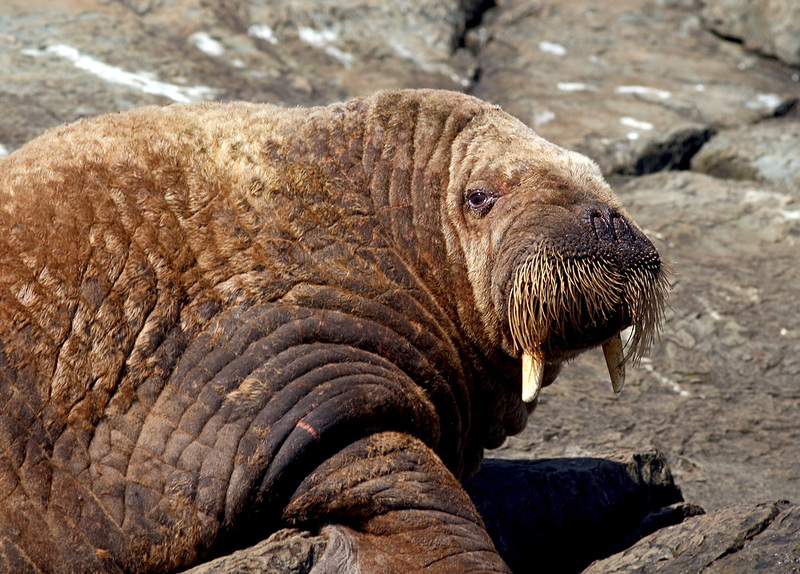 You’re so lucky to have seen this walrus! Love this post! Hi was he on the north side of Bay Bulls harbour? I was told he was close to the Bread and Cheese B&B. Yes … he was hanging out on the very tip at Bread & Cheese Point, on the north side of the harbour. I heard he was not seen this afternoon though – maybe he moved on? Enjoyed your interesting post and…wow, the pictures! Thanks for the great pictures. We really enjoyed them as we visited Bay Bulls a few times. 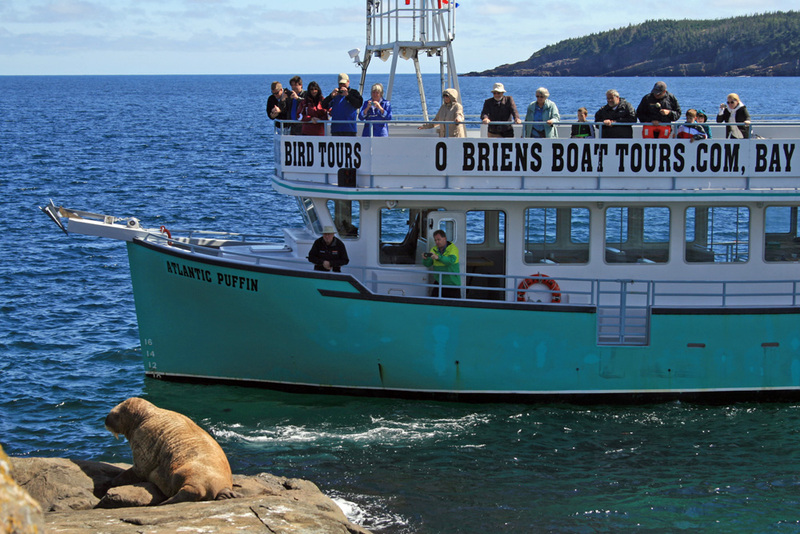 We already took O’Brien boat tour twice and we only have good things to say about their tours. You are very lucky to have seen this event! Thanks for sharing this Walrus, I wish I could have been there! That’s awesome Jared. So happy for you. What a great sighting!